Wary and withering looks were not in short supply, I can tell you. 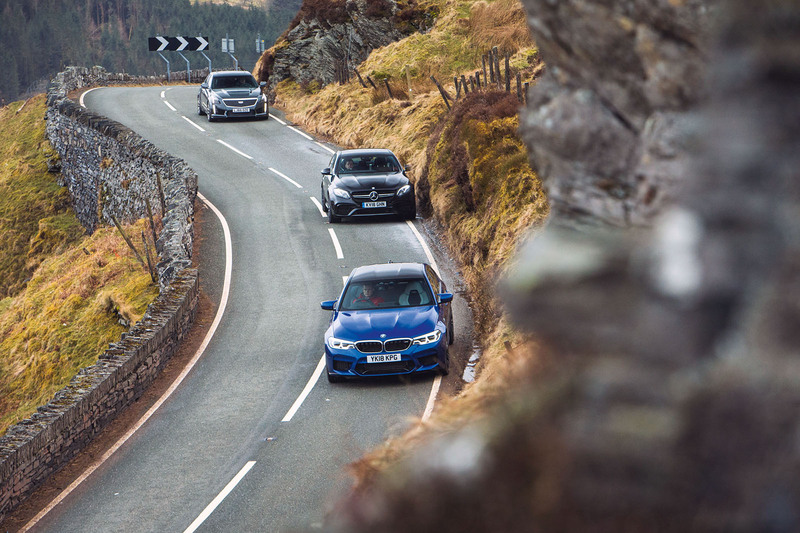 A three-car, near-2000-horsepower, 10-wheel-drive convoy of super-saloons rolling up next to a gently steaming strip of Tarmac, freshly laid by one of North Wales’ finest road resurfacing crews, is evidently a rare occurrence in those parts – and also a cause for muttering concern. So it was last week. With the snow melting across the Snowdonian valleys, the good local councillors had plainly sent out the diggers, mixers and rollers to deal promptly with the potholes that elsewhere in Britain were doubtless being left to cause angry consternation and inevitable correspondence. Bravo, we should add: civic responsibility, thy name is Gwynedd. 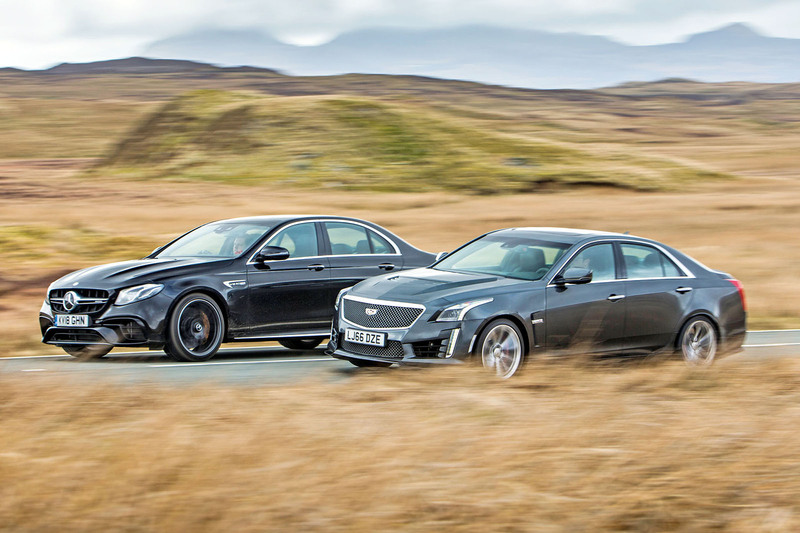 Except that in one particular instance, before the Instarmac had fully set, there we were, just as they were picking up the cones, in a 604bhp four-wheel-drive Mercedes-AMG E63 S, a 640bhp Cadillac CTS-V and the new 591bhp four- wheel-drive BMW M5, apparently ready to furl up the untouched, still hardening, barely painted road under our wheels like loose carpet. That was the unvoiced accusatory tone of those looks, at any rate, which certainly proved one thing beyond doubt: that the days when fast saloons like this could pass under the radar are now long gone. Then again, when the horsepower bar is set at 600 and the cars are capable of hitting 60mph from rest in less than 3.5sec, the modern super- saloon only gets the sort of attention that goes along with that supercar performance level, I suppose. It’s natural to wonder what on earth these other-worldly executive four- doors are like to drive; and perhaps curiosity was all it was. And, had we been sharing a table at the local nutritious breakfast eatery, I’d have been delighted to tell the chaps in question the truth of it: that these cars are all every bit as rapid as you might expect them to be, but far from identically rabid. Actually, I’m not sure we were really in ‘convoy’. ‘Motorcade’ might have been a better word, since the procession in question included a Cadillac. We thought it only proper to pluck rivals for the new BMW that would represent as stern a test as possible. In the one corner, then, wearing the obsidian black shorts with the chrome trim, was the car you will have expected to front up for this exercise. The E63 S 4Matic+ beats the new M5 on both power and torque but uses a twin-turbocharged V8 engine (exactly like the BMW); it has a four-wheel-drive transmission that can revert to rear drive on request (exactly like the BMW); it has a 0-62mph acceleration claim that matches that of the BMW to the tenth; and it is priced close enough to the BMW to acknowledge the inevitability of the comparison. But the CTS-V isn’t so obvious, is it? Isn’t so ‘luxurious’ or ‘premium’, isn’t as technologically advanced or expensive, and isn’t nearly so German; facets you’ll doubtless quite like about it. 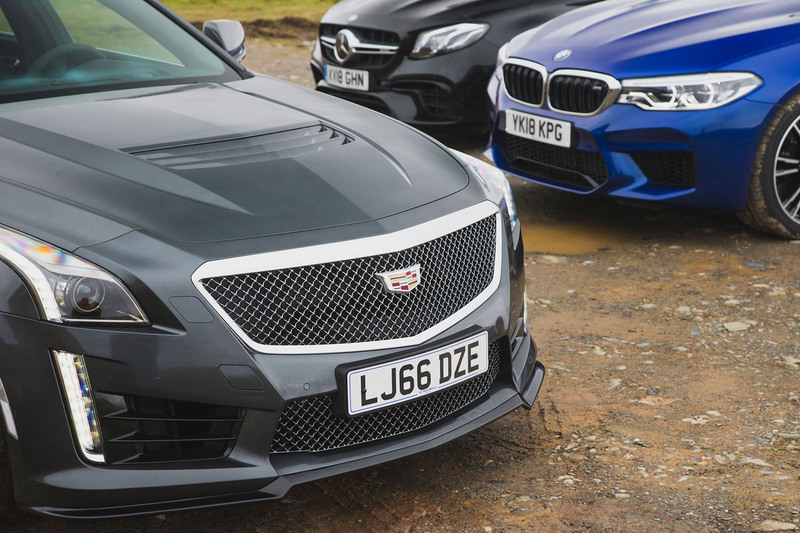 Moreover, whereas the M5 and E63 have departed from the classic super-saloon’s mechanical recipe, the CTS-V is like a rolling, whining, thunderous tribute to it. It has a supercharged two-valve V8 engine, one driven axle, and up to 631lb ft and 640bhp to throw at it – in that order. It also has an unrestricted top speed that stops short of the big ‘2-0-0’ by one solitary mile per hour. How could a car like that not get an invite to the new M5’s welcoming party? Super-saloons are a peculiar breed of performance car, and there are three big questions to answer about these ones, I reckon: how usable, comfortable and practical they’d be on a daily basis; how fast and exciting they are on UK roads in 2018; and how complicated they have become. Let’s take those in order. Is the mid-sized executive saloon the most natural candidate for the super-saloon treatment? It’s highly debatable, but the size of cars such as the new M5 works both for them and against. A proper mid-sized saloon gives considerably greater comfort for four adults than, say, a BMW M3 or Alfa Romeo Giulia Quadrifoglio would. No part of any of these cars looks or feels small or confined – not the back seats or the rear door openings or the boot, and especially not the driving environment. As far as practicality is concerned, these are fully grown-up cars. There is also very little to chose between them when you’re looking for relative merit. The E63 has, by a whisker, the biggest boot of our three and, by an equally slim margin, the roomiest cabin and the most comfortable seats, although the M5 is very competitive and impressive in all three respects. The CTS-V’s boot is slightly small in relative terms, but it still seems big when you’re visually sizing it up. But big on the inside means big on the outside too. Would you be surprised to read that the new M5 is wider across the door mirrors, for example, than a McLaren 570S? The E63 and CTS-V squeeze under that threshold, although they both feel like sizeable cars on typical British A-roads and B-roads. But there’s no mistaking that the 5 Series feels widest of all – and it’ll be wide enough to make plenty of owners think carefully about the sorts of roads they seek out in it. The Cadillac is left-hand drive only, which brings its own challenges. 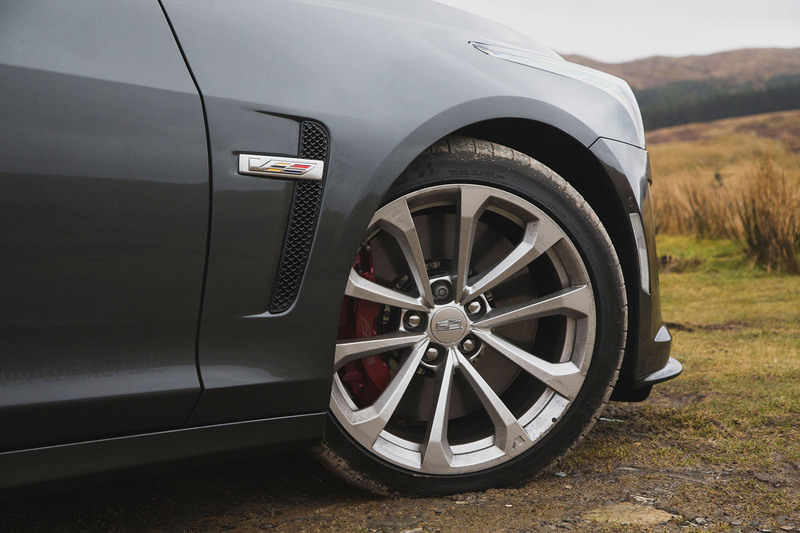 Our test car – supplied by the UK’s only appointed Cadillac dealer, Ian Allan Motors – felt wide on narrow roads for a different reason: because it takes a while to get used to riding so close to the verge. You get better at keeping the offside wheels from clobbering the cat’s eyes with practice, thankfully. That the perceived quality of the CTS-V’s interior isn’t a match for that of its German rivals will be something you mightn’t be surprised by, but it’s intended much more as a compliment for the M5 and E63 here than as a criticism of the Cadillac. The luxurious look and feel of the BMW’s cabin is every bit as pervasive and convincing as the Mercedes’ is. At other price points, a current E-Class will always shade an equivalent 5 Series for tactile material richness and luxury feel, in my experience. But for every place the E63 tries to pull out a lead, the M5 has an answer. 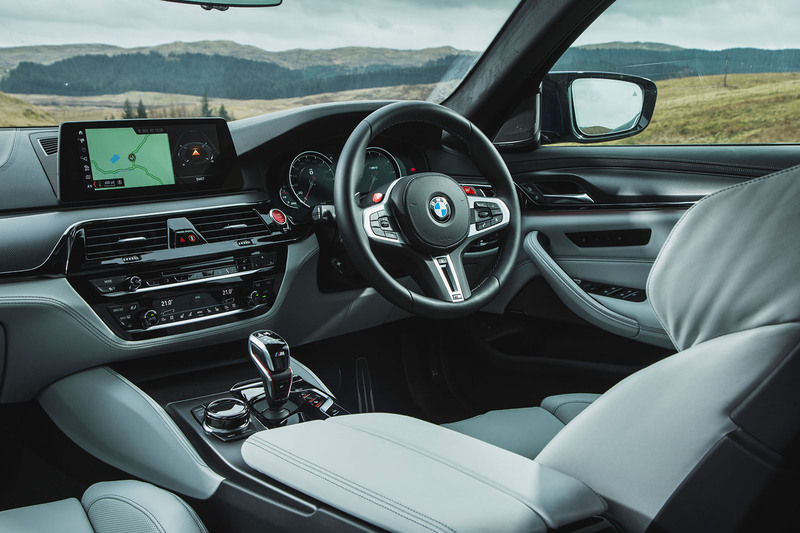 The BMW’s soft merino leather dashboard looks and feels great and its instrument display seems equally attractive. It even has perfumed air conditioning. Autocar group tests have been known to smell like day-old coronation chicken, atomised Windowlene and festering trouser cough (sorry, lads) – but this one certainly did not. And what about rolling comfort? Because while it’s nice to stretch out and feel at home in your 600-horsepower daily driver, it’d be even nicer to find that it rides with subtlety. We’ll start comparing the detail of the driving experiences of these cars by simply observing that, if you like your four-doors fast, stable and fairly laid-back, it’s the E63 S you’ll probably like best. Having driven a different example of the E63 last summer, I was surprised to find our group test trio so simple to characterise on these terms, because the first E63 I drove back then rode like a different car from the one put forward for this exercise, having been firm-riding to the point of frustration. But I’ve tested several others since, and it’s becoming increasingly clear that the car’s comfort level has indeed been improved by AMG’s switch to all-corner air suspension. All three of these cars are operated through driving modes, but the E-Class’s Comfort setting comes the closest to delivering what it says on the tin. It has a ride that’s slightly noisier than the BMW’s but is more settled over smaller lumps and bumps and more agreeable at low speeds. The M5’s suspension, even in Comfort mode, makes for a ride that is always busier than the E63’s and can fidget slightly when disturbed. The CTS-V doesn’t have a Comfort mode, but in Tour it’s certainly less sensitive to surface changes than it is in other settings. Straight away, however, the Cadillac reveals itself as a more simple and straightforward car than either of the other two, with less dynamic breadth of ability: when you want it to be more reserved and easy to drive, it’ll meet you only halfway. The CTS-V’s steering is twice as reactive to bump and camber as either of the other cars’, and its ride feels considerably shorter and clunkier. ‘Simple and straightforward’ has its advantages, mind you. There is an honesty and charm about the Cadillac that makes it feel like a car to cherish, and its seductiveness is, first and foremost, audible. Between the whine of the supercharger ahead of you and the unreconstructed burble and yowl of the quad exhausts behind, you can’t help but love the way this car sounds. It sounds authentic, you see – unlike the BMW (which doesn’t always have the sonic drama you might want from a super-saloon) and the Mercedes (which often has too much) when both rely too much on imitation engine noise piped in via the stereo speakers. Both the Germans have sports exhausts with ‘noisy’ modes, but neither is allowed solo billing when its V8 is at its wildest; and when there’s a 600-horsepower V8 to listen to, how daft is that? And even though the M5’s audio system engine sounds are the more contrived of the two, the E63’s end up irritating you just as much once your brain starts successfully filtering out which kind of rumble is coming from where. The CTS-V, on the other hand, just layers on the delicious bleeding-heart rawness with greater and greater abandon as you flex your right foot. As one colleague aptly suggested, it might as well be shouting ‘fake news!’ at its opposition from across the continental divide. Does that make the CTS-V’s driving experience the most compelling of the three, then? Well, it’s not a bad start – but in the finish, I’d be amazed if anyone unfamiliar with the specification of these cars would nod at anything other than the AMG after being sent away to drive them and then asked which was the most powerful. And the best-handling? A different nod again. 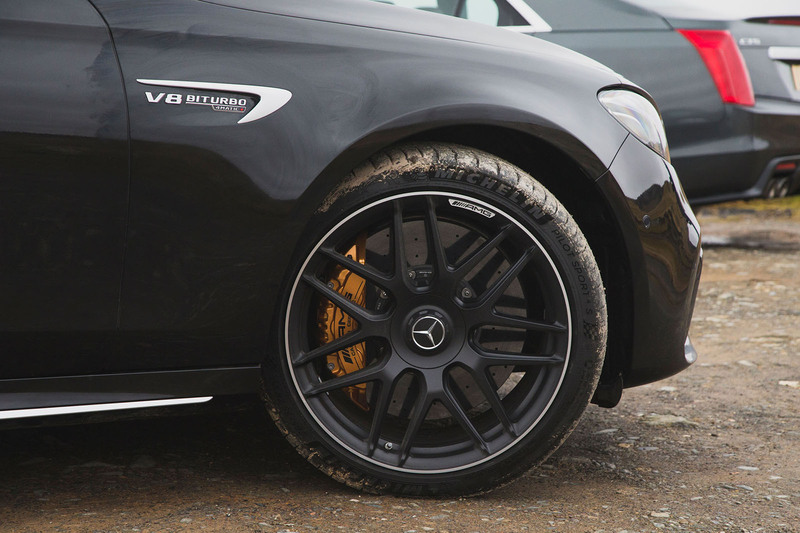 It’s impossible to feel the full accelerative potency of any of these cars for more than a few seconds on the road, of course, but because it has such incredible torque, the AMG’s V8 certainly makes the most of those few seconds. What a monumental engine. The M5’s performance level is almost as ballistic, but it gets better with revs so you’re more inclined to use the full span of the BMW’s rev range than you are in the E63. The CTS-V, meanwhile, doesn’t quite deliver the savage hit of force that its outputs promise or that its exhaust noise seems to be announcing. 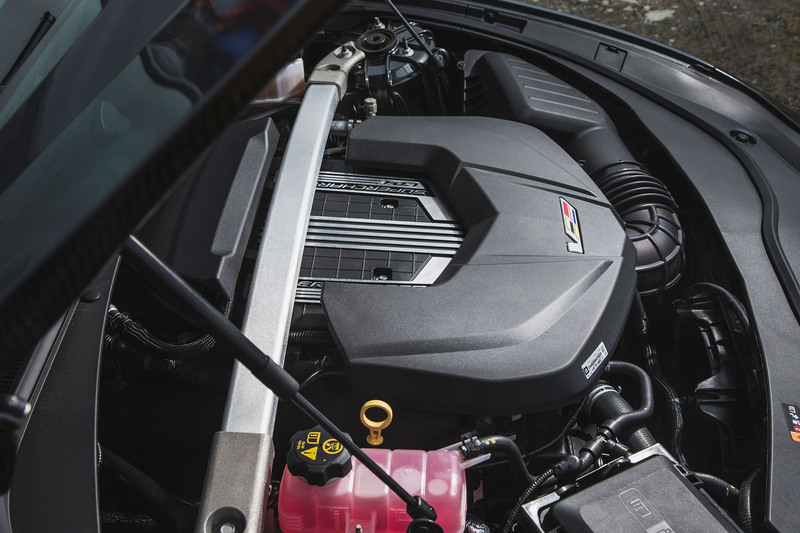 Like the BMW’s V8, the Cadillac’s is an engine that needs to be workedto really come to the fore, but it’s just a shame the car’s suspension doesn’t deliver a more composed platform to inspire you to do that more often. Because despite the big billing and the murmurs of approval from voices on the other side of the point, the CTS-V doesn’t quite handle well enough to cut it in this company. In isolation, I dare say it’d meet most dynamic expectations of a fast four- door – but in comparison with the incisive steering, supreme balance and unbelievable body control of the BMW, and a Mercedes that isn’t far behind in all of those respects, theCadillac struggles. It struggles for outright grip and traction (surprise, surprise), for vertical body control at times and, very occasionally, for stability too. But what strikes you most about the big American, with familiarity, is the disconnect between the pace of the car’s steering and the softness of its rear axle, the latter seeming to take its time to settle onto its loaded side after the former has wrenched the car through the turn-in phase with all of the gentle moderation of a presidential handshake. The M5’s handling, meanwhile, couldn’t present a starker contrast with that of the CTS-V. It’s so outstanding, in fact, that even the walloping E63 isn’t ultimately in the same league as a driver’s car. It’s a brilliance you have to invest in before you can fully unearth it on the road, though – which brings us neatly to the last of those big questions we talked about earlier: complexity. The M5’s driving experience is complicated, you see, even by the standards of a typical modern performance car that seems to have adopted the concept as an end in its own right. The car doesn’t just have a handful of driving modeslike the Mercedes and Cadillac but also presents you with a dizzying number of choices about how you want its engine, gearbox, power steering, suspension, stability control system and four-wheel-drive system configured. With each system, you can choose from three preset states, which means this car doesn’t really have one driving experience you need to get to know but rather 18 of them. Seems ridiculous, doesn’t it? It’s certainly a turn-off while you’re getting acquainted with the car, especially if you’re not used to the way BMW M division handles this stuff. But the funny thing is that it doesn’t take more than an afternoon to suss it all out. As you quickly learn, the top Sport+ and otherwise most aggressive settings for all of those individual systems are best left for track use, and with a lot of the rest of them, you’ll have an instinctive sense of what you like and what should work well for the road you’re on. Chances are, you’ll find more than one combination of settings that works well, because the M5 is that kind of car: a rear-driven sabre rattler to be enjoyed at its most unhinged at one moment, and a more moderate, balanced, apex- threading precision instrument the next. And here’s the best news: you can have both, one immediately after the other, minimum fiddling required. BMW’s configurable driver presets allow you to save your two preferred combinations of steering weight, damper setting, shift logic, inter- axle torque bias and more, and then jump between the two with a flick of your thumb, using the anodised orange ‘M1’ and ‘M2’ buttons on the steering wheel spokes. The way the BMW so cleverly packages, harnesses and wields the complexity of its driving experience ends up being the icing on the cake of a driving experience that is a monument to its creators. This car may not have the sledgehammer grunt of its opposite number from Mercedes-AMG, but it takes the super-saloon into new territory anyway with the remarkable, multi- faceted breadth of its CV. Want the handling agility and adjustability of a proper rear-driven sports car? Or the dynamic security and stability of an Audi RS, perhaps? Or to run with a Porsche 911 Turbo over a standing quarter? Or just to sit back and devour mile after mile of high-speed motorway in first order comfort and luxury? It’s all here. The M5 does the lot. And a car that so plainly advances its breed, setting new standards as a driver’s car as it goes, can only be a winner. Where do you buy a Cadillac CTS-V? If you’re tempted to take the left-field route into super-saloon ownership, Cadillac currently has only one appointed UK dealer for sales, service and parts: Ian Allan Motors of Virginia Water (ianallanvirginiawater.co.uk, 01344 842801). The 66-registered 5000-mile car in our story is currently the only new or nearly new CTS-V for sale in the country, yours for £59,995. 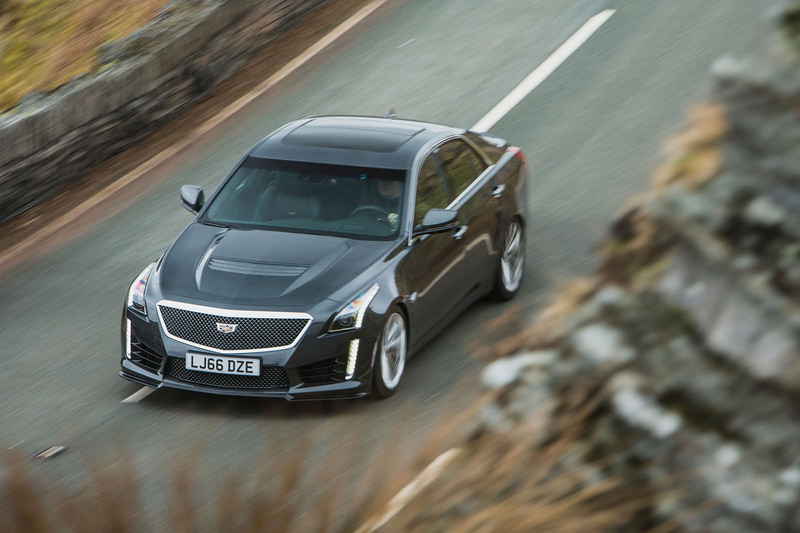 Dealer principal Kevin Hurl explains why the CTS-V remains a rare sight on UK roads – and it’s not exclusively down to the car’s left-hand-drive-only control layout. “We can’t offer the same finance packages as the likes of Porsche, Mercedes and BMW, so buyers have to come to us with finance in place,” he says. That does make the CTS-V a bit of a niche choice – but that’s also part of the appeal if you like the idea of driving something that isn’t seen every day. Ian Allan’s ex-demo example has plenty of desirable options, among them red brake calipers, a sunroof and Cadillac’s Performance Data Recorder, which works through the touchscreen infotainment system and records video footage of track laps overlaid with timing data. In 1985, surprisingly few tipped the E28-generation M5 as a game changer. Screaming supercar power backed a beautifully deft chassis with a propensity for oversteer – all in a four-door saloon. Nothing like it had ever been seen. The E34-gen M5 might have softened some of the E28’s edges, but it’s no less exciting. Later 3.8s are more powerful than the original 3.6s, and the six-speed cars are reckoned to be the best – but any E34 is scintillating to drive. There are still plenty of high- milers around, but pay £12k for a decent one and you’ll have one of the best cars ever made. Mad V8 provides lazy torque or high-rev thrills: take your pick. Either way, driving an E39-gen M5 is an event. Is there a cheaper way to own a V10? Doubtful. Famed for its complexity, the E60 M5 is a world of pain if you buy a dog – but good ones are pinpoint precise, look terrific and sound astonishing. Prices could yet fall further too. 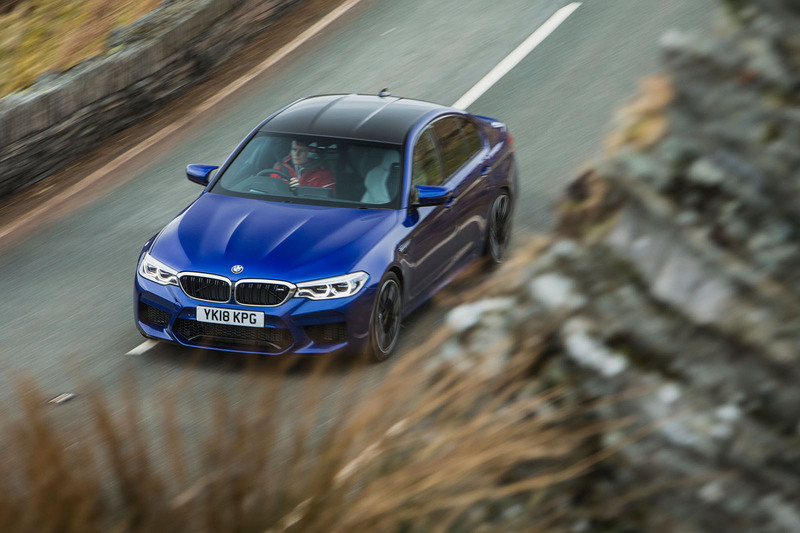 With 552bhp – 567bhp if you chose the Competition Pack – the F10 M5 marked a step change from deft, rev-happy finesse to constant, brutal power and crushing capability, but that meant it could now be all things to all people. 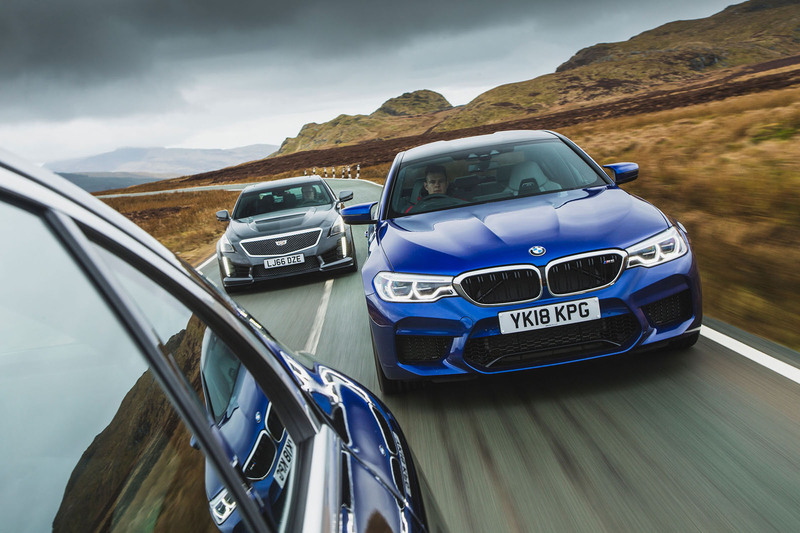 "2nd - BMW M5: Does ‘fast and laid-back’ better than the BMW." Do you notice your print error? Yeah, also confused. Assume that's for the AMG but does that mean the order changes? The BMW wins not the AMG. M5 wins in the text but not in the rating? This really should have been proof read, there's also a pic of the caddy with amg engine description text. The caddy is a very left field choice being almost unavailable over here but having something different is always appealing. For super saloons these are now too big for our roads, except blasting up motorways, the C's 3's & 4's out there have grown over time and are surely big enough space wise but usefully smaller to be fun on uk roads. Still better than the equivalent suv though. A quick word written in haste.....? Mercedes Wins....because it is the best of the the three. In fact it's the best super saloon there is right now. BMW is good, however, this new model IS to complex, granted there are the two M buttons but who? will be switching them from road to road? No the Mercedes is the best, only every time a new M5 is made it always seems to be the new best thing? You guyz are fast...you changed the print just after my post...But considder this, AMG have always played second fiddle to M division when it comes to super saloons, the E63 has now come on far enough to be an honest alterantive without excuses. ...so we find the BMW is the better drivers car, The Mercedes-Benz despite the towering engine the better cruiser.....so nothing new here - has been so for the last 30 years! ...and the Cadillac is a 'leftfield' choice - read choice of an idiot, acknowledged by the fact that there is only one in the country!!! Cant think why Ian Allan's would want to lumber themselves with this franchise. They are based in an area full of Americans Chinese and Middle Eastern nationals, but you dont see any of them driving this piece of GM junk around the area! The area around Wentworth/Virginia Water has the highest concentration of Mercedes-Benz per household in the country....a known fact. Says it all really. There's invariably one buffoon eager to dismiss the Cadillac as "GM junk" when they've never even driven one. Little Englanders can be so abjectly sad.